Vancouver, BC - Skyharbour Resources Ltd. (TSX-V: SYH) (OTC Grey: SYHBF) (the “Company”) is pleased to announce it has entered into an Assignment and Novation Agreement (the “Agreement”) with Triex Minerals Corp. (“Triex”), a wholly owned subsidiary of Canterra Minerals Corp. (“Canterra”), whereby Skyharbour will acquire Triex/Canterra’s 60% interest in the Mann Lake Uranium Project (the “Property”). The property is strategically located on the east side of the Athabasca Basin approx. 25 km southwest of Cameco’s McArthur River Mine and 15 km northeast and along strike of Cameco's Millennium uranium deposit. Under the terms of the agreement, Skyharbour will pay $15,000 in cash and issue one million common shares in consideration for Canterra’s 60% interest and their option to purchase up to 1.5% of the property’s underlying 2.5% NSR for $1.5 million. 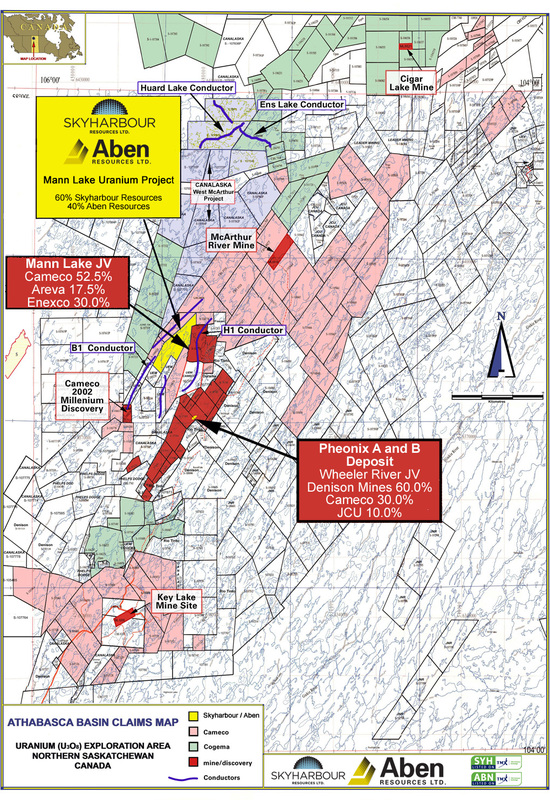 Triex/Canterra’s Mann Lake property is also adjacent to the Mann Lake Joint Venture operated by Cameco (52.5%) with partners International Enexco (30%) and AREVA (17.5%), in which an aggressive 13,000 metre, 18-hole diamond drill program is slated to commence this month (see International Enexco’s November 13, 2013 News Release). High-grade, basement-hosted uranium mineralization was intersected on this project during the 2006 diamond drill program, including 7.12% U308 over 0.25m and 5.53% U308 over 0.4m. The Mann Lake Uranium Project consists of one mineral claim covering 3,473 hectares located in the eastern Athabasca Basin in northern Saskatchewan. The property has been under a joint venture agreement with Aben Resources owning 40% and Triex owning the other 60% interest in the property. It occurs within the corridor that contains the richest uranium deposits in the world including Cameco’s McArthur River Mine. The technical information in this news release has been prepared in accordance with the Canadian regulatory requirements set out in National Instrument 43-101 and reviewed and approved by Richard Kusmirski, P.Geo., M.Sc., Skyharbour’s Head Technical Advisor, a qualified person. Skyharbour Resources Ltd. is a uranium exploration company and a member of the Western Athabasca Syndicate which controls a large, geologically prospective land package consisting of five properties (287,130 hectares or 709,513 acres) in the Athabasca Basin of Saskatchewan. $6,000,000 in combined exploration expenditures over the next two years is planned on these properties, $5,000,000 of which is being funded by the three partner companies. Skyharbour also maintains a diverse portfolio of precious and base metal projects in the Red Lake district of Ontario. The Company has 43.6 million shares outstanding with insiders owning over 25% of the outstanding shares. Skyharbour’s goal is to maximize shareholder value through new mineral discoveries, committed long-term partnerships, and the advancement of exploration projects in geopolitically favourable jurisdictions.